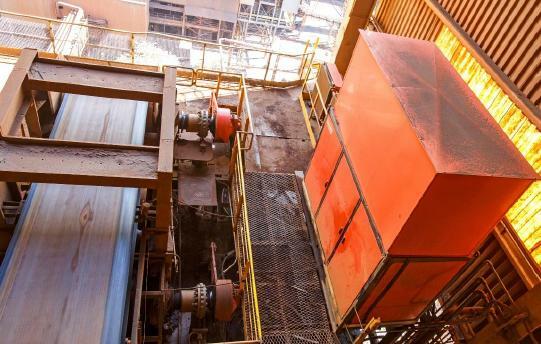 A Brazilian mine producing 40 million metric tonnes of iron ore each year has for the first time equipped one of its belt conveyors with a Hägglunds hydraulic direct drive system. This installation has led to clear and substantial improvements in the conveyor’s safety and reliability. With their direct-mounted motors, infinitely variable speed and resistance to shock loads, hydraulic direct drive systems combine peace of mind with high productivity. This is why one Brazilian multinational producer of iron ore chose to install a Hägglunds direct drive from Bosch Rexroth on one of its conveyors. The Hägglunds system replaced an electromechanical drive running at constant speed in combination with a fluid coupling. The new solution comprises two Hägglunds hydraulic motors of type Hägglunds CB, as well as a Hägglunds hydraulic drive unit including the control system. Tight integration between the mine team and Bosch Rexroth engineers in Brazil allowed the switch to be made in just three days. The simplicity of changing to a hydraulic direct drive was clearly indicated in the mine’s feasibility study. The modular Hägglunds solution could be installed in limited space and without alignment problems, thanks to flexible placement of the drive unit and the mounting of the motor directly on the pulley drive shaft. For the mining company, however, conveyor safety was the strongest argument. Not only are the hydraulic motors insensitive to dust and grit, the drive system also protects the conveyor from high stresses, for example during starting. Together with the elimination of sensitive and open rotating couplings, this creates a system that is safer for the operator and more reliable for the mine. As shown by the mine’s records, the exchange of drive system has done away with a good deal of maintenance. Because the drive unit provides a variable hydraulic flow to the Hägglunds motors, in response to a control signal, the mine can now fully control the conveyor speed and adapt it to what is needed at any production rate. The variable speed also enables precise control and positioning, for example when inching the belt for inspection. Perhaps most importantly, however, the excellent controllability allows the conveyor to be soft-started, which minimises stresses on belts, other components and the machine structure. Measurements show that the mine’s conveyor moves around 2,700t per hour with the Hägglunds drive system, which is slightly more than with the original drive. With the system setup and electric motor power now installed, it is actually possible to substantially increase the speed or torque without affecting the service life of the drive. "The diagnostic tests that have been carried out show that the drive system is in excellent condition, and that the mining company can increase its production volume significantly if needed," says Kjell Byström, Engineer at Bosch Rexroth. "The mining company is very satisfied, which has been our experience virtually every time a hydraulic direct drive has been installed on a conveyor. It’s a pleasure to see."